Ever since the first TV commercial premiered way back in 1941, video has been a boon to marketers. And ever since Facebook launched in 2004, the social networking behemoth has been advantageous to advertisers. Now, the two have come together to mark another first — in 2015, more marketers will run video ad campaigns on Facebook than on YouTube. According to the "State of Video Advertising" report by video and social advertising provider Mixpo, 87% of respondents will run a video ad on Facebook while only 81.5% will utilize YouTube for the task. To put this shift into perspective, the ratio was 77.8% to 63% in favor of the video-sharing site just last year. The survey — which polled 125 agencies, brands and publishers — also indicates an uptick in interest in running video ads on Instagram, LinkedIn and Twitter. To better understand which metrics advertisers covet for video ads in social the most, Mixpo asked respondents to list the three most important metrics (see below) on which they focus. In a surprising twist, video views, a traditional go-to video metric, came in fifth. The top three are engagement with interactive elements, shares, and conversions — indicating that video ads delivered in social are expected to draw more than just eyeballs in this day and age. 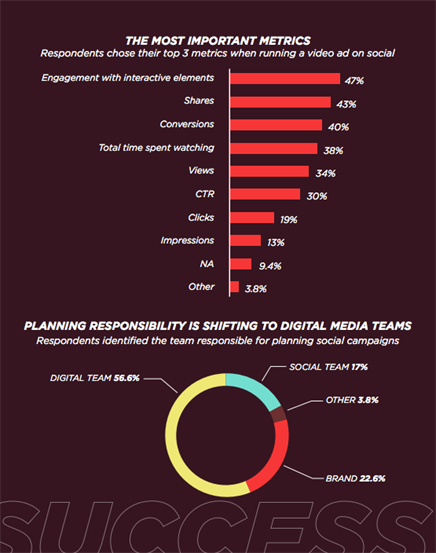 What's more, although more than 80% of respondents say they consider social advertising important or very important, Mixpo reports a disproportionately low percentage of digital budgets going toward social, especially considering how much time users are spending in social. "The advertisers we talk to are all generally interested in running video ads in social," says Justin Kistner, VP of marketing at Mixpo. "What we see holding them back is a lack of experience. We created this report to not only give advertisers more insights on the macro trends, but also specific, tactical knowledge from actual campaigns." Google+: The social platform that brands forgot?